In our endless task to brew better beer, we decided to go BIG with our ninth batch of home brew. Our original attempts at an IIPA fell woefully short of the style and it was time to remedy that. 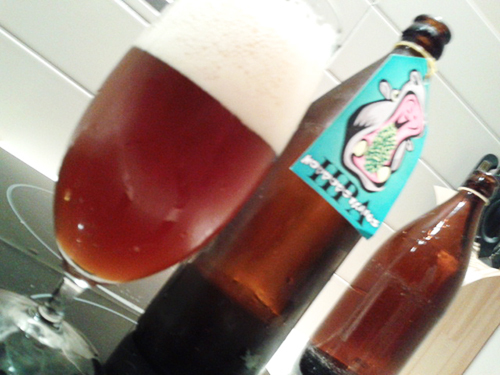 This beer, Hoppopotamus, was to be one of our entries for the National Home Brew Competition. Batches four and six were both great in our humble opinions and additionally we managed to repeat the recipe (which was an achievement in itself). But for the home brew comp we needed it to fit the style better. Previously our kit was too inefficient and it would have been almost impossible to hit the required O.G. but thanks to Chris at Banks Brewing we now had ourselves a much more efficient system. Now, with a sparge arm and false bottom, 44 litres at 9% looked a much more achievable target. The big, desired abv of 9% meant we needed to add more grain and that proved to be the first obstacle. Evidently the required grain for 44 litres of 9% ale struggles to fit in a 50 litre kettle, who knew? As it was, we managed to make it through brew day with minimal dramas and even hit our targets. Six weeks later we were cracking the top on our very own 9% Imperial IPA. Bringing the glass to my nose the first aroma was mostly alcohol, somewhere in behind it was a caramelly note and some fruity esters too. Sadly, the taste wasn’t much different as the caramel malts struggled to punch through the alcohol heat and we all wondered where the hops went. Now we are almost five months on from the bottling date and the beer has evolved immensely. The alcohol has mellowed out considerably since the first tasting and the flavours are much more rounded showing toffee and dried fruits. The beer is now living up to its namesake, unassuming yet deadly. One thing you should all take away from this is to not make too many changes at once.